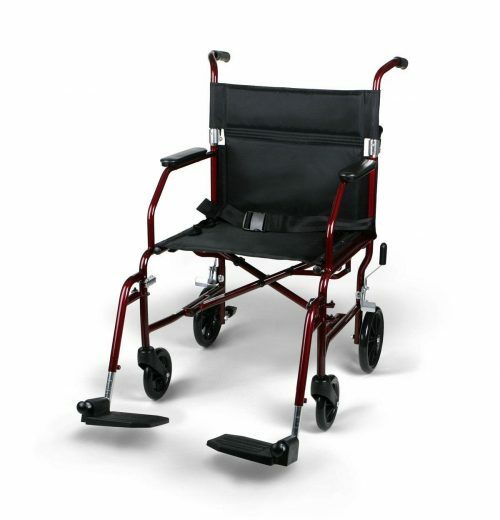 The UltraLight Transport Wheelchair by Medline is the perfect choice for moving someone around a house, neighborhood, or park. This sturdy, lightweight transport chair has a 48.3 cm (19-in.) wide seat that can safely support passengers up to 136.1 kg (300 lb.) The UltraLight Transport Wheelchair is constructed of light-weight aluminum. The footrests on this chair are pushbutton adjustable and come with convenient “stow away” clips that lock the footrests to the side of the chair when not in use. The seat and armrests both feature black nylon fabric padding that is comfortable, stain resistant and easy to clean.